Two years ago I asked, Where Are The Aluminum Air Compressors? I wrote the article after draining my air compressor, seeing the rusty water come out, and wondering why they didn't make tanks out of aluminum. An aluminum tank would solve the rust issue and make the tool a bit lighter as well. In the article I mention that after a search I found Maxus aluminum air compressors, but as of now it looks like they are no longer made. Jump to today and I have found a new maker of aluminum air compressors. I just happened to be looking at air compressors on the Home Depot website and the word "aluminum" passed into my field of view. I quickly scrolled back up the page to where I had seen the word to make sure I was not seeing things. What I had seen was a description for a California Air Tools compressor. 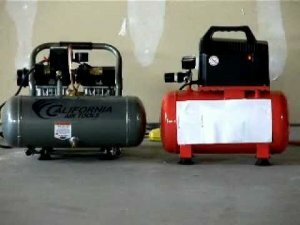 California Air Tools makes a number air compressors, both with aluminum air tanks and with regular steel tanks, but what they really seem to be proud of is their Ultra Quiet compressor pumps. C.A.T. uses pumps that run at a lower RPM to keep the noise levels down, but to maintain a quick recycle time the pump uses two large air pistons versus the standard single piston. So while the aluminum tank brings the weight down, the larger pump does seem to bring the weight back up a bit. If you want an air compressor with a tank that will not rust and is "Ultra Quiet", you might want to check out the California Air Tools compressors offered at Home Depot.